While I didn’t use it to wash my car because I’m paranoid of scratches, it works excellent as a Wash-as-you-Dry product. Most people should have no trouble using it as a complete vehicle wash! Want to wash your car or truck but don’t have a lot of water? Stock up on microfiber towels before using a waterless wash! 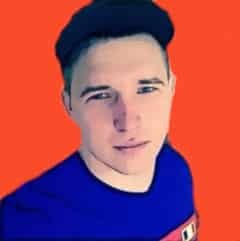 Hey there I’m Matt and right now it’s May 2018 and there was some kind of royal wedding going on… Well, I don’t know much about royal weddings, but I’ll tell you what I know and that’s how to take care of cars. So rather than watching Prince Harry and Meghan leave to Winsor (boring!) let’s talk about the Aero Cosmetics Wet or Waterless Car Wash review. We recently wrote about these products (Best Waterless Car Wash) and have gotten a lot of questions about the Aero kit. There are a couple of things you need to know about so-called waterless wash and wax products. They are not entirely intended to clean your car without water because they are only good for light detailing and cleaning jobs. If your car is festooned with an inch or two of dried-on dirt and dust, you will still need to hose off the exterior and wipe away excess dirt on the surface before using the waterless wash and wax. If your ride looks like this, you’ll need a full “water” car wash! The benefits of waterless washes really come into play for our friends who live in areas like California where they have water restrictions, or water is expensive. By using one of these products, you can go weeks and months without a full “water” car wash.
Another thing you need to know about waterless car cleaning products: you will need to use a lot of microfiber or terry cloth towels to clean an average sedan, and this is considering the fact the car is not overly dirty and soiled. Since you are basically ‘dry cleaning’ the car, microfiber towels are much preferred over conventional cotton towels. Microfiber has the ability to attract and trap large amounts of dirt and dust deep into the thick piles of fiber in the cloth. Microfiber will also prevent scratches and swirl marks from occurring since you are basically wiping down a lightly moist or dry surface. If the towel is soiled, replace it immediately to reduce the risk of scratching the paint surface. What impressed me most about the Aero Cosmetics Wet or Waterless Car Wash is the water-based biodegradable formula. This aerospace-grade cleaner is devoid of harsh detergents, alcohol, or ammonia and is safe to use on both interior and exterior surfaces. The cleaner is safe and non-irritating to the skin and eyes and is safe to use around pets as well. The cleaner is proudly made in the USA and meets or exceeds the cleaning specifications of Boeing, Airbus Industries, and McDonnell Douglass. The product is not only good for automotive painted surfaces since it is also great for boats, motorcycles, airplanes, and recreational vehicles or RVs. The Aero Cosmetics wash-wax-all is a complete cleaning kit. It includes a full gallon of the cleaner, a full 16 oz. spray bottle of the cleaner, 4 microfiber towels, and an aero mini scrubber. The scrubber is basically a light-colored sponge that you can use to agitate the surface for tough stains and dirt. The cleaner will not only dissolve dirt and dust, but it leaves a UV-protective, non-stick, and anti-static coating over the surface. This is the waxing part of the process. But how good does it perform as a cleaner and wax? If your paint looks like this, the Wash-Wax-All kit should work great for you. You should also understand how the cleaner works. The UV-protective layer of wax will only serve to enhance the finish of the surface. It is not capable of bringing out shine and gloss from dull or oxidized paint. The cleaner is non-abrasive and will not remove scratches or swirl marks. If your vehicle has a lot of swirl marks, you will have to wash, polish, and wax the finish to erase them. In my many years of experience testing cleaning products, polishes, and waxes for cars, I came to the conclusion that paint and exterior maintenance demands a proper set of skills to achieve the best results. It all starts in the washing process. 99% of the times when I wash my vehicles, I just bring out the hose and car shampoo because my 2012 Charger has a got a Midnight black paint and I’m paranoid of scratches. For this reason, I didn’t use the Wash-Wax-All kit on my car when it was dirty. However, as you can see in JuanStop’s video it works perfect on deeper colored cars. But I’m just paranoid so I didn’t use it on my 3-week dirty car! What I did instead was give my Charger a proper bath and then applied the Aero Cosmetics kit. After rinsing off the car shampoo from the exterior, simply spray the product on the surface and proceed to dry the vehicle using a clean microfiber towel. I really liked how the product managed to uplift the shine and color of the paint after washing the vehicle. You can think of this as the perfect product that replenishes the essential oils in the paint in-between waxing. I now use the Aero Cosmetic each and every time I give my car a full body bath. It is easier and less time consuming than applying a separate coat of wax. I also like the fact the product will work on a wide variety of plastic, rubber, chrome, and fiberglass surfaces. I even use the product to remove grime and nasty stains on the bathroom tiles at home. 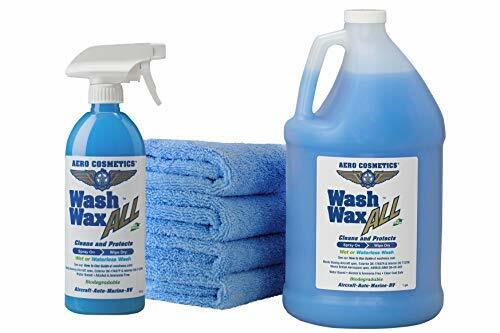 This waterless wash and wax cleaner is not what you would call cheap, but you do get a lot of the product and a couple of microfiber towels in the mix. Depending on how you use the cleaner, this entire kit can ‘wash’ approximately 36 cars. If you use it like I do (the wax-as-you-dry method), the product is enough to wax around 50 or so vehicles. Unlike other waterless wash and wax cleaners, you don’t need to mix the Aero Cosmetics Wet or Waterless Car Wash with water. It is ready to use right out of the bottle. Simply spray a liberal amount of the cleaner on a small section at a time. Wipe off the liquid using a microfiber towel. Turn over the towel to the other side and lightly buff the finish to a smooth shine. That’s the entire cleaning process in a nutshell. I know plenty of people who rave about this stuff as being the best waterless car wash kit for boats, planes, rvs and yes, even cars. As long as you know how to properly use the product, the Aero Cosmetics Wet or Waterless Car Wash Kit will amaze you. I consider it as an all-purpose cleaner that can easily clean and add a layer of protection on a wide array of painted, coated, or matte surfaces with minimal effort.